Tompkins Center for History and Culture (TCHC) will be a vibrant cultural destination on the Commons in downtown Ithaca. 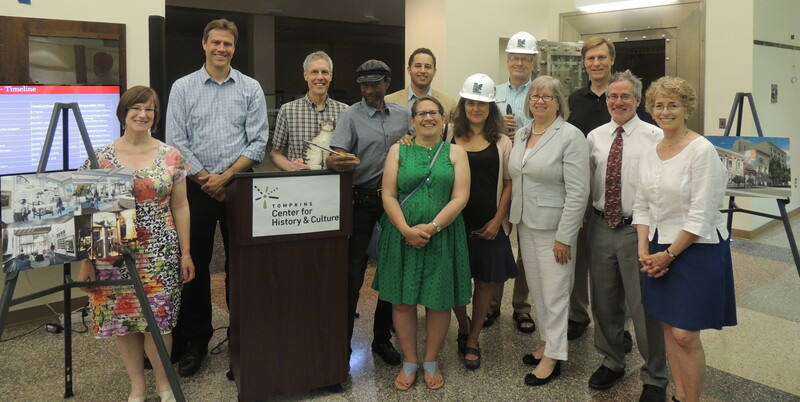 To celebrate the start of its construction at 110 North Tioga Street, Ithaca, NY (the former location of Tompkins Trust Co. bank), a team of TCHC partners shared the exciting plans for the new Center at a public construction kick-off ceremony on Monday, July 2. The program took place in the atrium and main floor of the new Center and ncluded remarks by Rod Howe, Director of the History Center and Peggy Coleman, VP Tourism & Community Relations of the Chamber’s Convention & Visitors Bureau, Martha Robertson, chair of the Tompkins County Legislature, NYS Assemblywoman Barbara Lifton, Mack Travis, Jean McPheeters, and other partners instrumental in bringing this community project to fruition. Construction plans and documents and interior design slides were shared with attendees. On December 2017, the New York State Regional Economic Development Council’s (REDC) Southern Tier region awarded two grants to The History Center in Tompkins County to develop buildings previously owned by Tompkins Trust Company on the Ithaca Commons’ bank alley into the TCHC and to construct and promote the combined Convention and Visitors Bureau (CVB) downtown visitors’ center, The History Center and other history/heritage/cultural organizations, thereby creating a destination spot to engage the public in a vibrant exploration of our unique community through history, heritage and cultural lenses. When complete the TCHC will act as a hub for visitors to be oriented to local and regional tourism opportunities. The desire to relocate The History Center spurred this project and won support from the County Legislature. Tompkins County purchased the buildings from Tompkins Trust as the Trust Company moved to its new building on the 100 block of East Seneca Street. County Legislator Chair Mike Lane said “I am delighted that the REDC awarded this grant to support our community’s new cultural center.” The Legislature is certain that this investment will benefit the citizens and businesses of Tompkins County as well as visitors to our community. TCHC is an exciting addition to the Commons and a place where anyone-visitor or resident-can delve deep into the County’s unique history, or use it as a spring board to venture out and about and explore Tompkins County. “Wharton Studio Museum is thrilled to be a partner,” — said Diana Reisman, Executive Director of the Wharton Studio Museum. As Tompkins Trust Company moved to its new headquarters in spring 2018, the code work and reconstruction on the new Center also began. STREAM Collaborative is doing the design work, Tessellate Studios is designing the new exhibit area and Iron Design has developed the logo, website and marketing collateral. LeChase Construction is constructing the new space. The Tompkins Center for History and Culture is expected to open in early 2019.